Horsey Windpump is a four storey tower made of red brick and was built in 1912; it is now a grade ll listed building and is in the care of the National Trust and it provides unmissable views from the top, looking across the surrounding countryside. At the moment it is without sails as they are in need of restoration – all part of keeping the history of the mill alive. The area is a haven for wildlife – a wonderful place for walking and bird watching. 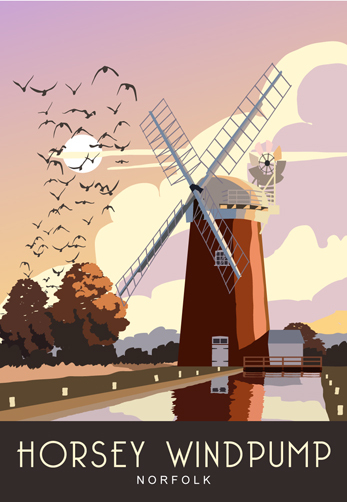 This picture, part of our Norfolk series, depicts and Autumn scene at sunset. This entry was posted in national trust, norfolk, village, Vintage, windmill and tagged autumn, Horsey, national trust, Norfolk, sunset, Windmill, Windpump. Bookmark the permalink.